Rob Nelson has the latest on the shooting. BROWNSVILLE, Brooklyn (WABC) -- Police have arrested a 14-year-old boy accused of killing an innocent teenager on a Brooklyn playground. 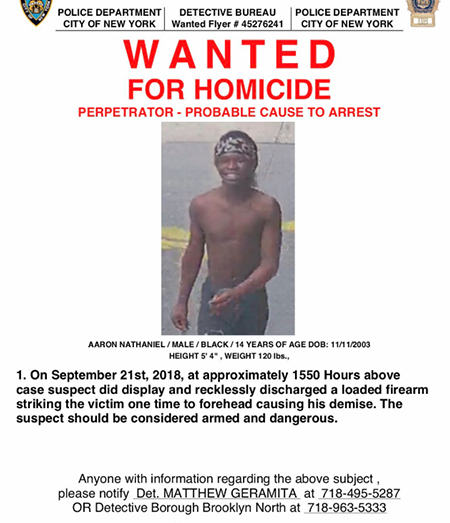 The NYPD asked the public for help in finding 14-year-old Aaron Nathaniel, who they said fired a gun at that Brownsville basketball court. He turned himself in to police on Wednesday evening. Nathaniel is now facing charges of murder, criminal use of a firearm, and criminal possession of a weapon. Police said two shots were fired from more than 100 feet away, hitting 16-year-old Oluwadurotimi "Timi" Oyebola in the head and killing him while he was playing basketball a week and a half ago. Timi's family, friends and the community held a vigil and walk in his honor Monday night. Many of those in the crowd were trying to wrap their head around the loss. "It's sad that these kids are just picking up guns, and they're shooting and killing innocent, this was a bright young man," a mourner said. "Picking up a gun, killing someone like this is senseless. We're not only destroying families, we're destroying generations." Police said Oyebola was not the intended target. Instead, they believe the suspect tried to shoot someone he was playing basketball with that afternoon. A wake has been set for Friday at the Guarino Funeral Home, and his funeral is set for Saturday.